One of the way in which you can book meeting spaces through Operate is by using the Calendar tool. You can find it under the Calendars tab of the main navigation menu. To get started making a booking, select a date and time; as well as the duration for which the space is being booked. The calendar will now highlight the available spaces, according to the date and time you have searched for. Use filters and calendar views to narrow down your results. Now click and drag in the slots that you want to book. Select a Resource - This is the meeting space you’re booking and it is predefined according to the calendar slot selection you just made. You can change it here if you like. Give a title to your booking - Be short and specific, so that you can easily distinguish this booking in the future. Select the customer account for which you are making the booking. Select a contact - In case there is no contact listed for the particular account you’re booking for, then this option will be disabled. Choose a lead source - Here is where you can select the means through which you have come in contact with the customer who is booking. Add the booking date - This should also be pre-filled, according to you calendar selection. You can change the date if needed. Add a start and end time - This is another pre-filled field, which you can also change if required. Choose the space in which the catering will take place. Add the charges corresponding to your booking. Use the Add New Line button to add a new charge. You can add charges related to booking fees, catering, services, etc. Confirm it if you are sure that the booking is definitive. Set it as Provisional if it is possible for any changes to occur. Set it as Unassigned if a potential customer wants to lock a slot. An unassigned booking will lock the slot, but will not be assigned to any particular customer until a firm decision is made, whether to book or not. Apply the Day Delegate Rate.- You can use this option to provide a discounted date, per delegate/attendee per day. 13. Cancel the booking by pressing Cancel or Back to Calendar. 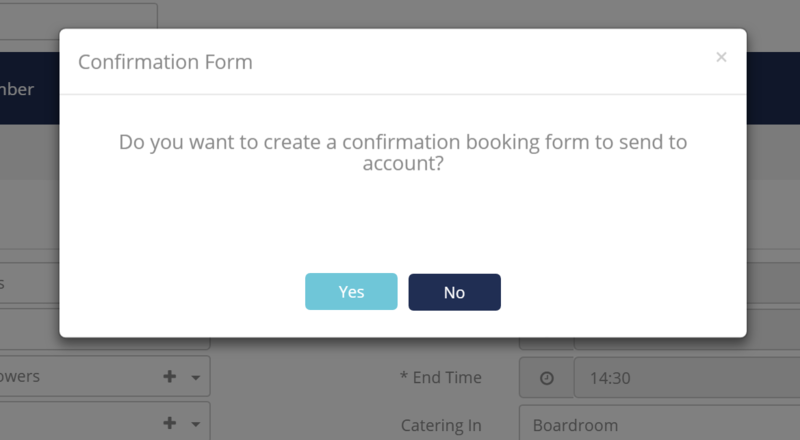 Operate will now ask whether you would like to send a booking confirmation form to your customer. If you choose to do so, the form will be displayed on screen. At this point, if you want to make any changes to your Booking form, you can edit it right after generation. You do not need to adjust the template, you can just enter your desired information within the existing form. Your Booking Form will open within a WYSIWYG editor which comes with a toolbar, as well as additional tools that are available when you place your cursor onto the rorm. Here is a general button glossary that provides details on the available editor tools. When you are ready, you can review, then either print or email the form to your customr. 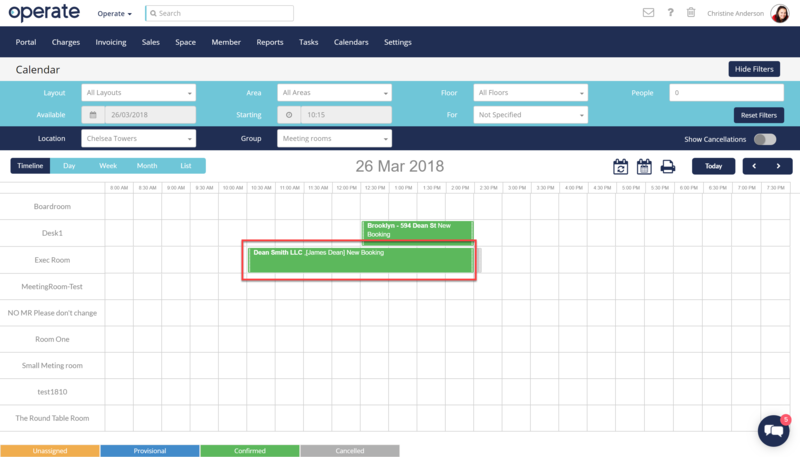 IOnce created, your booking will be displayed on the calendar and highlighted in the colour corresponding to its status. 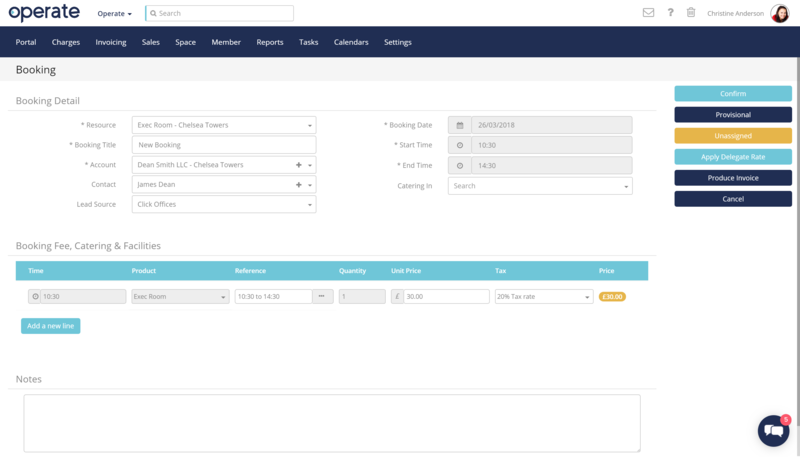 Use the Bill Run to create invoices automatically, on a monthly basis - Operate will pull your bookings during the Bill Run process and create invoices for them all or add them to your customer's final monthly invoice. Manually, by selecting your booking on the Calendar, then choosing to Produce an invoice. 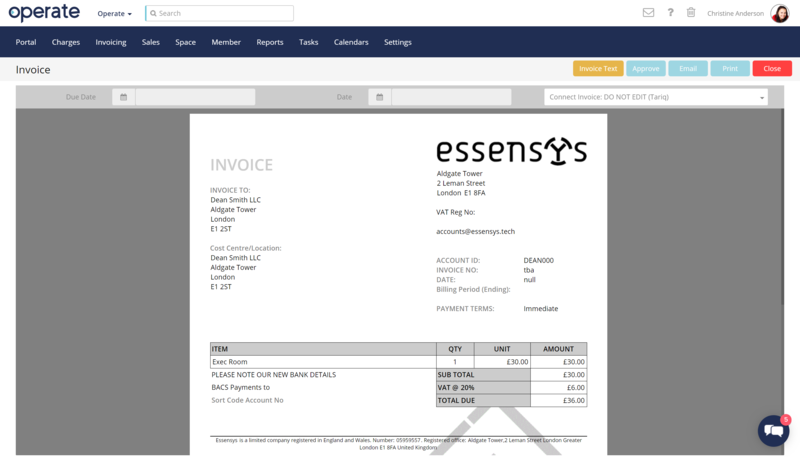 Operate will now create a Draft Invoice, which you can review and approve. You can then issue it to your v=customer by printing or emailing it. Read more on managing invoices. To access the booking options, click a booked slot in the calendar. The options differ, depending on the status of the booking. Unassigned bookings can only be edited in order to make changes, such as confirming or cancelling. Provisional bookings can be edited, confirmed, cancelled or deleted right from within the options menu. You can also set additional statuses, such as: Standard, In Use, To Be Cleared or Cleared; depending on what the case may be with regards to the meeting room being booked. In addition, you can generate a booking form or function sheet as needed. Confirmed bookings come with the same options as the Provisional ones; but also allow you to produce an invoice for the booking. 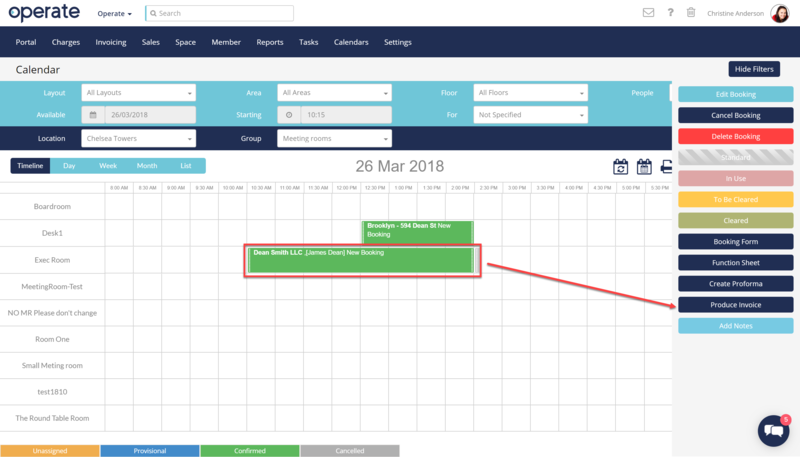 Once a booking has been added you can review the charges by either viewing the booking in the calendar module or by checking the the account and viewing the current charges. Once you complete a bill run the charges for the specified period will then be added to a invoice.